It's been a great pleasure to have my driving lessons with Graham, amazing instructor, he has patience with you all through your lessons, the way he encourages you bring out your confidence and that you can't fail your test. In fact I will recommend Graham to everyone who wants to easily pass your driving test, he really brought joy to my face after so many attempts with others without success. Thanks Graham. I would like to thank you hugely from the bottom of my heart for your irreplaceable support. I appreciate your determination in showing me that I can do it and I did it with your candid encouragement and preseverance. May Almighty God reward you abundantly. I just want to say thank you very much for helping me pass my driving test. I really appreciate how extremely patient you were with me. Your calm manner really helped me develop confidence in my driving. Thank you for your style of teaching that was always personalised. I especially liked that at end of each lesson we would discuss how the lesson went and set objectives for the next one. I never felt rushed but assured that I could learn to drive at my own pace. I will definitely recommend you to others. Thank you very much . Graham has been a fantastic, he listens extremely carefully to your needs and helps you feel more confident by working on these. But never pushing you or putting you down. He is always patient and is only happy once you are totally happy and confident in yourself. All lessons enjoyable and you really can feel that you have learnt and progressed with each lesson you take. He is extremely knowledgeable and I am extremely happy I came to him from another instructor. 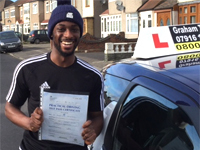 The opportunity to learn with a trainee instructor (Elvis) was also very beneficial to the learning experience. 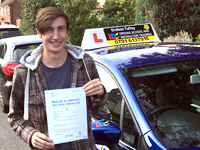 He helped me get my confidence up quickly after starting with him and this kept improving with my lessons right up until my test where I was extremely happy to pass first time. 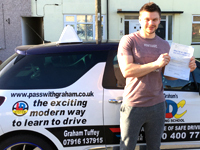 I would not hesitate in recommending graham to any other learners. Great pass with just one driver fault. Graham was recommended to me by a family member and I am thankful that he was the one to teach me how to drive. Graham is not only patient, but also very thorough in his teaching, ensuring that any mistakes, even the smallest ones, are corrected and explained. The ins and outs of driving were explained very clearly and ensured that everything from road position to observations were consistently done right. This high quality tutelage allowed me to pass my test on the second attempt with only one minor fault, and such a result would not have been possible without Graham. 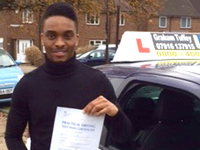 I would highly recommend him to anyone looking to pass the test as a high quality driver. Thank you so much again Graham for teaching me how to drive. I was so pleased with all of the lessons we had. If I struggled with something you would always make sure to work on that straight away and stop that issue. You made the lessons enjoyable to learn rather than boring. I would recommend you as a driving instructor to anybody. 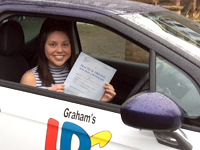 After having three driving instructors over the course of 9 years and thinking I would never drive, I could not recommend Graham enough to anyone that wants to not only pass with ease but develop their self confidence in their driving ability. He was patient from day one to the day of my test and for someone who would apologise after every mistake and have it hanging over my head i am able to keep myself cool calm and collected and passed first time. He made driving fun!! I will miss my lessons with Graham. Top quality instructor. Worked hard and got there in the end! Finally I passed….. After lots of attempt. To clarify I was the person who after my first failure took a 4 year break before resuming lessons. I found Graham via the LCDC website and went straight to the testimonials. Everyone spoke of his calmness and belief in them while he was teaching them to drive. I was sold at this point and booked a semi intensive course. The course was different to what I had previously encountered, lessons were planned and there was a rating system at the end of the lesson which helped me alot. After my first fail with Graham I was disheratened but we took stock and decided to carry on.We prepared for the 2nd test and I failed again..but strangely I wasnt disheartened this time. I felt confident and knew of little irks that needed working on.We booked the test for a 3rd time and both Graham and I knew this was the day I could pass. That is exactly what happened. From this experience I can wholeheartedly say, if you want someone to teach you how to drive well for life, to do it with patience and reassurance and to give you a confidence boost when needed, look no futher. Graham is the driving instructor for you. I couldn't have asked for a better instructor. Graham explains everything clearly and paced the lessons to my ability very well, and I'd always look foward them as he makes sure they're a pleasant experience. After every single lesson I felt that I'd made genuine progression and that my time hadn't been wasted. Thank you! Passed first time with just one driver fault. Being taught by Graham was something I can only describe as everything you need in an instructor; calm, patient, very good with communicating what needs to be done and a genuinely nice person. Graham never asked me do something I wasn't comfortable with, and I think that is the key to success, letting you go at whatever pace you want, no pressure, and that definitely helped me pass first time. I can't recommend Graham enough, there's simply no one else like him, it was a pleasure! Thank you for everything, it's been a genuine pleasure. Thank you Graham soo much for your help and support I have really appreciated it. I test drove a Ford Fiesta 16 plate today I loved it, it feels great to drive and will be picking it up Saturday ! Thank you so much Graham for your fantastic support from the beginning, im very excited to have passed my test, you did a wonderful job guiding me and encouraging me a lot......Goodluck with your other clients. I would like to say a huge thank you to Graham for everything he has done for me. I truly believe Graham is not only one of the best instructors out there but also one of the greatest people I’ve spent time with. The way Graham teaches is incredible. He is so patient in the way he teaches and makes it a fun exciting experience. What is so great about Graham is how quick he wants you to pass your test but yet he makes sure you are very safe and aware on the road. Also I was so nervous about starting to drive on my lessons but Graham was quick to assure that ill be fine and made me very comfortable and the lessons soon became a very fun driving experience. Thank you Graham for everything I wish you all the best in the future. I was nervous about learning to drive in the beginning, but I was recommended Graham by a family member. Graham was very understanding and helpful with nerves when teaching, always reassuring and very relaxing to drive alongside. Very Patient at the start, and throughout the process. 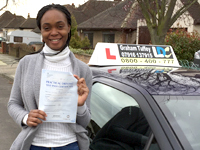 Very reliable and the evaluation at the end of each lesson was very useful to advance my driving skills. I have thoroughly enjoyed my learning experience with Graham and would highly recommended him to anybody who is new to driving. I myself, was nervous about getting behind the wheel for the first time, but Graham's lessons have been an absolute joy. Every lesson I have had with him has been in a calm and relaxed atmosphere, and he ensures that the time you pay for, is dedicated entirely to you (friends of mine have shared their instructor stories with me where they just drove to the next students lesson and picked them up, or stopping off at the shops so the instructor could pick up their groceries. There's none of that nonsense with Graham). Overall I think that Graham is a brilliant instructor, and I consider myself fortunate to pass my test under his guidance, and I will always be thankful for his patience. Thank you for everything Graham. I know I can be challenging but you stuck through it by my side and made me a better driver. Without you I wouldn't have passed the first time around. You have been patient, reliable and gave me some of the best advice. I would highly recommend you to anyone. It has been a pleasure learning how to drive with Graham. Before him, I had an instructor who didn't gave me too much confidence. 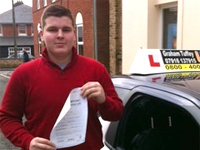 After meeting Graham, I felt safe and able to drive my own car before I took the driving test. He is very patient, he always understood (even with those who do not know English well), friendly, calm ... He is a professional. When you say a GOOD DRIVING INSTRUCTOR, you say GRAHAM. I highly recommend Graham. Mi-a facut plăcere sa învăț să conduc cu dl Graham. Înainte de el, am avut un instructor care nu mi-a dat prea multă încredere in mine. După ce l-am întâlnit pe dl. Graham, ma simțeam în siguranță și capabil să-mi conduc propria mașină înainte să iau permisul de conducere. Este foarte răbdător, se face întotdeauna înțeles (chiar și cu cei care nu cunosc limba engleză bine), prietenos, calm... este un profesionist. Când spui un INSTRUCTOR BUN, spui GRAHAM! Recomand cu încredere dl. Graham! I am generally a very sensitive person and was nervous to choose someone to teach me but my family recommended Graham and it was the best choice I have made. Me and my whole family have passed with Graham, which already shows the diversity of people he can work with. The main reason why he is so great is that he is very calm and has a lot of patience, always adjust to what speed you are comfortable working with as well as having a lot of knowledge about safe driving. He loves his job and actually believe in what he does rather then just taking on a person, passing them and that's it. 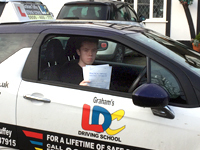 As all new drivers are nervous and have many questions, Graham is has a great system in place which helps you evaluate your own driving test and really show you how you are improving each day and what can be worked on a little bit more. Thank you Graham for being a great instructor and passing me within such a limited time! Having taken the 1 week intensive course I was very happy to pass! 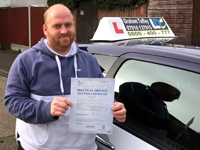 Graham was very professional and calm in teaching myself throughout the course and gave me the confidence and capability to become a qualified driver, I would recommend Graham to anyone who wants to drive. Graham Tuffey was recommended to me by a friend who has now taught me many things about driving. He is a very calm and considerate instructor who respects how you want to be taught and encourages you to do your best. I liked how you learned at your own pace and building confidence as you grow as a new driver. I was very happy that I took that recommendation from a friend and will recommend Graham to anyone who asks. 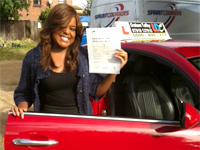 After having a few driving instructors that I didn't get on with and put me off driving I felt like I would never pass . I decided to give it another go and took up driving lessons with Graham , I enjoyed my lessons and passed quickly , I would definitely recommend him for anyone looking for a great driving instructor . 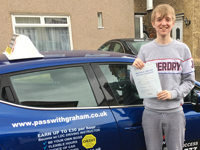 Graham was a very patient driving instructor who explained everything in a way that was understandable to me, I would highly recommend him as a reliable and brilliant driving instructor, he helped me through my whole experience and without him I would not have passed so I would just like to say thank you. It has been fantastic and a real pleasure learning from Graham! 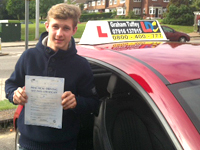 I passed first time with Graham and from the start I could tell Graham was different. From my own personal driving experience with other instructors is that I had is a very poor and un professional one. I cannot express how much better he is. I had found Graham online and never looked back. A full 5 star out of five I would give to Graham. He has a very high knowledge about driving and he make you a safe driver on the road. Grahams instructor style is very warm, friendly, calm and respectful. Graham will structure the lessons around your needs and capabilities to help you pass. After each lesson, he will get you to evaluate your own performance and master it in the next lesson. One of the main difference that makes Graham different from other is because he composed, passionate and he will never get frustrated with you and he will give you confidence.I can't speak more highly enough about Graham and I would recommend him to anyone who is looking for a great driving instructor. 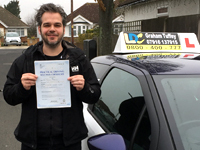 I was recommended to Graham through a family friend; he is an excellent instructor who is very professional and I would definitely recommend him to my friends as well. I found that he was very patient and helpful throughout the whole process. 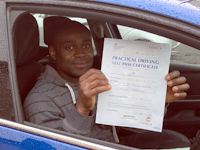 Mr Graham is the best instructor I have ever met he is very professional in his job He is a calm person explained you exactly the way you have to drive on your driving test so you know what you are expecting . Even your first language is not English doesn't matter he try the easiest words for you to manage for the Show me Tell me Test. Monsieur Graham est le meilleur instructeur que j’ai connu. Il travaille avec beaucoup de professionnalisme et très sérieux dans son enseignement. Il est toujours à l’écoute de ses élèves et très patient. Il ne lésine pas sur les moyens afin que les élèves sont affutes pour le jour du test. Je recommande fortement Mr Graham à tous ceux qui ont besoin d’une formation pas seulement pour passer le test mais aussi pour être un conducteur attentionné et prudent. Graham was recommended to me through a family friend and I am very happy that I chose to take my driving lessons with him. I would definitely recommend Graham to anyone who is nervous about starting to drive as he has a very calming approach and makes you feel very relaxed, even when learning more challenging techniques. Graham is very good at adapting to different learning skills and always gives you many different ways of approaching things. Thank you Graham for turning me into a confident driver, I am extremely grateful. 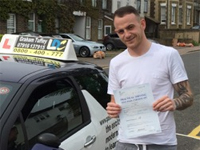 I initially chose to go with Graham as an instructor as a friend recommended him to me, and after the whole experience i would recommend Graham to anyone who wants to be a good driver and have a relaxing and constructive lesson experience. Every lesson with Graham was constructive and went at a pace i was comfortable with. Graham's teaching style feels tailored to you which makes you feel very relaxed when on your lessons and because of this it is less daunting to go out of your comfort zone which means the lessons are worth the time as you are progressing well. I think that anyone will be able to pass when learning with Graham and i highly recommend him as an instructor for anyone. Thanks Graham for a great learning experience. After having numerous driving instructors who were terrible, Graham taught me to drive. He is an excellent instructor. He was always helpful and patient. 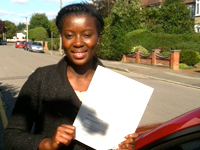 I was so happy with everything I learnt and was thrilled when I passed. I would recommend him to anyone who wants to drive. 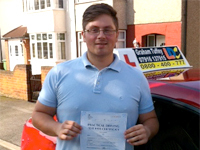 Graham Tuffey is a driving instructor from Rainham who I was recommended to by a family friend. 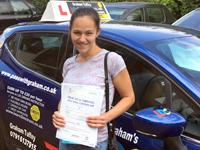 I took my first ten lessons with graham and found him to be a very knowledgeable, helpful, polite and patient driving instructor after 10 lessons I felt I was ready to pass my test but only with grahams guidance. I was lucky to pass first time but extremely lucky to pass with no minors it’s safe to say I couldn’t have passed without grahams help so once again thanks graham for you time and experience. I'd like to say thank you to Graham the best driving instructor anyone could ask for, for getting me though my lesson and getting me ready for my test I would recommend him to anyone Thanks Graham. Graham has been an excellent driving instructor. Extremely friendly and patient. He always made sure that we covered areas that I felt less comfortable with. Even when I didn't believe in myself he believed in me. 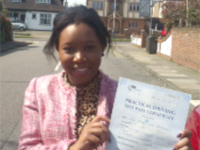 I felt so happy when I passed and I felt so grateful that I achieved this because I learnt from the very best driving instructor ! I will be recommending Graham to anyone I meet in the future who harbours the desire to drive. Graham is a real friendly, calm and patient instructor who has many ways of teaching, and tailors each lesson to your learning habits. I have had a few instructors in my time and Graham is head and shoulders above the others. You will be happy to have made the decision if you go with Graham, and will be driving before you know it. Thank you so much, Graham. 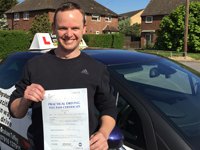 Graham is a brilliant instructor who offers an enjoyable service that leaves you feeling relaxed and confident from the first time you get behind the wheel. The lesson plans are clear and focused towards your specific requirements as an individual. He is patient and understanding and more than willing to repeat a lesson if you feel that you are not grasping a certain skill. Graham also provided a free workbook that allowed me to track my progress which motivated me to improve even further. 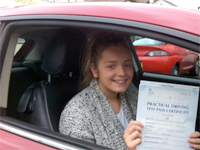 You are not only prepared to pass a test but also how to maintain a safe, high standard of driving after you have passed. I cannot speak highly enough of his services and would recommend to anyone who wants to learn to drive. 5/5. I contacted Graham in late 2016 as I had received a job offer which was conditional on me getting a driver's licence as soon as possible. Graham phoned me back the same day that I emailed. He understood the situation and went out of his way to make sure he could accommodate me. Driving was something that I had put off for too long and had therefore become a huge psychological hurdle for me. However, from lesson one it was clear that Graham was completely professional and receptive. I couldn't have imagined how quickly and effectively he was able to prepare me for my test; which was great for both me and my new employers. I'm extremely grateful to Graham and wouldn't hesitate to recommend him as an instructor to others. I want to thank you once again for todays outcome. I was really pleased. 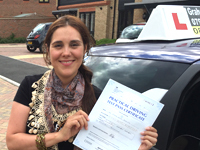 I would highly recommend anyone to use you, you're very friendly, easy going and a fantastic instructor. I'm glad I chose to learn with you, the lessons are well worth the money and every lesson was exciting. I knew from the start that I made the right choice. Even when I was being negative, you gave me the confidence and that helped alot. Graham is a great teacher. I started driving with no experience and Graham was able to teach me, and I have now passed my test. He will always push you to the best of your ability and knows what you can do, even if you feel like you cannot do it. He’s alert and is always there to provide help and stay safe if you ever mess up. Graham is always on time when arriving to lessons, and he is always prepared. Learning to drive with him was a pleasure. 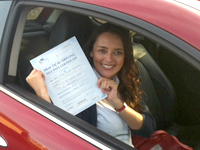 I'm over the moon to say that I passed my driving test first time with Graham, who has been fantastic! My own personal driving experience before finding Graham was not good at all to say the least. 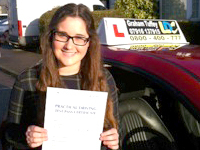 I've had 3 terrible driving instructors prior to Graham, with stories that are hard to believe. The whole experience left me feeling like I was never going to pass my driving test and never find a good driving instructor. Luckily I found Graham who from the outset was in complete contrast to my previous instructors. Graham has a passion for teaching and for how you individually learn. My lessons where planned from the beginning to the test day, and I always felt that I was moving at the right pace, always aware what I would been doing on the next lesson and what I needed to work on. One of the most important things for me was that my instructor was calm, and Graham did not once loose his temper or in anyway got frustrated if I got it wrong. I can't speak highly enough about Graham and I would recommend him to anyone, especially if like me you've not had the best luck with instructors. Don't give up, give Graham a call. Graham made learning to drive not only educational but really good fun, using a variety of different learning techniques to suit the way I learnt, making the lessons tailored for me to help me get the most out of the lesson. Graham taught me the formal way of driving alongside practical real life driving skills to help me pass first time within a few months. Graham is also flexible which really helped with my own work life balance. I would most definitely recommend Graham to anyone wanting to learn to drive. I got a baby blue fiat 500 for Christmas, I was vary excited until I realised I had to drive back on the A12 by myself. But it was OK because I just looked super calm and collected on the outside and was screaming and crying on the inside.... Haha but thanks to your tuition I made it and it was actually really fun and I felt like I could just do it. So thank you. Hope you have a lovely new year. Thanks so much, for helping me pass my test first time. You were a great teacher, and so easy to get along with. I would recommend you to anyone who wishes to start driving. I am grateful for your detailed instructions preparing me to the driving test in UK. Thanks to your professional work, your patience to explain me every each necessary details, your patient focus on my weak points and persistent warnings I have been able to pass the examination at the first time. In addition, I am grateful for your after courses e-mailed feedback reports which gave me the opportunity to revise calmly what I have been taught. You have done a great and professional work and I need to admit that I have really appreciated your work discipline. Lucky all of your prospective learners too. Ingiltere’deki ehliyet sinavina beni hazirlarken detayli anlatiminiz ve talimatlarinizdan dolayi size minnetarim. Profesyonel is yapis biciminiz ve her seyi en ince ayrintisina kadar anlatma sabriniz ve hatalarima isaret etme sebatiniz sayesinde birinci kerede sinavi gecebildim. Ek olarak, her ders sonrasi, konulari sakin kafayla gozden gecirmem icin gondermis oldugunuz raporlardan dolayi da mutesekkirim. Gercekten iyi bir is cikardiniz ve itiraf etmeliyim ki is disiplinize hayran kaldim. Mustakbel ogrencileriniz cok sansli. Graham is probably the best instructor I could have asked for. He’s honest with you and gives constructive criticism as opposed to just putting you down, he always shows you how you can improve your driving. He is very flexible and always makes time for you and definitely gives you your moneys worth. He pushes you to do better but wont make you step out of your comfort zone at all….any other instructor and I don’t think I would have passed first time. So thank you mate. I started taking lessons back in the beginning of July with Graham after previously struggling and taking 6 driving tests with a different instructor. Graham was recommended to me by my boyfriend and his family who spoke and thought highly of him. Graham not only is a completely professional instructor, always on the ball, and brilliant with time keeping, he recognises any issues or weaknesses you may have and puts something in place to help you through it and better yourself. On the flip side he will always compliment you on anything you have achieved or improved on which is very positive for a learners self esteem. On the 13th September I passed my driving test with only 2 minors, this was the first test I had took after changing to Graham as my instructor, so that on its own speaks for itself. On a personal level Graham will always make you feel completely at ease and is incredibly friendly and supportive. I will definitely be recommending Graham in the future to any learner, whether they are starting right from the beginning or whether they are slightly more experienced learners struggling in certain areas like I was. From day one up until the last second before you walk out to your test Graham will be there to support you completely and prepare you. I couldn’t thank him enough for showing me the world of driving in a completely different light and helping me to achieve the main goal and pass my driving test. An all round lovely man, best in the business in my eyes, who will most definitely play a massive part to help you achieve. I found in Graham a truly amazing instructor!! I have been a driver for more than 10 years and I contacted Graham because I needed to transfer my driving skills to the UK. Thanks God I did!! I not only got my driving licence in the first practical test attempt but also I learnt so many new skills about driving that I know I'll use for life!! I feel my lessons were very thorough. I feel that Graham instructs very well as he remains calm. Graham explains what needs to be done or changed very clearly and in a way that the learner can relate to. I liked the fact that he told me what will be happening in the lesson and what will happen in the next lesson. He also tries to adapt the learning to suit you and how you learn best. Graham was also very professional but yet friendly and encouraging. I would highly recommend him. I began lessons with Graham after not making much progress with a previous instructor. The difference was visible immediately. Rather than just treating everyone the same and just telling you what to do Graham tries to find the best way of teaching individuals. This involves finding out more about each pupil and seeing what kind of person they are. I found this approach very unique and beneficial. Graham manages to strike the perfect balance between being professional and friendly/relaxed. Graham doesn't just 'get you through the test' (although he did, first time I haste to add!) 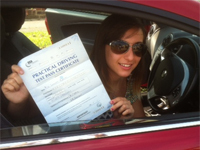 but equips you with driving skills and tips for life which are far wider than the scope of the test. I used two cars during my lessons, both were top quality and I feel far better than the typical 'learner cars' you see everywhere. 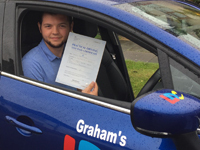 If you want a patient, friendly, knowledgeable and professional driving instructor who will provide you invaluable driving skills then Graham is your man! 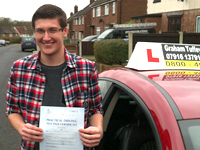 Once again a massive Thank you for all your efforts in helping me to pass my driving test. I've been driving with Graham since January this year after a long lazy absence from learning to drive. Comparing (as you do) Graham to previous driving instructors I have had, the differences were astounding. Graham pinpointed exactly the areas in which I needed to improve on straight away in a comfortable, relaxed but informative manner. Graham also uses diagrams for different road situations, to explain things in a theoretical way, which can help with understanding the task ahead, before you have performed it practically. Graham also gives you all the up to date, relevant driving information electronically, for example, Theory and Hazard perception apps to help you along the way. I wouldn't just recommend Graham as people's next choice of driving instructor... To me there's only one man to turn to! It's a no brainer!... Thanks Graham, it has been an absolute pleasure learning to drive with you, and from my family to yours, we wish you all the very best in the future. Gareth. I would just like to say you was a pleasure to learn with and thank you for all your help and patience. I would gladly recommend you to anyone I know in the future. When I started with Graham, I was rough round the edges and full of many mistakes. 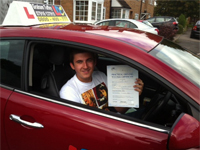 However Graham is a very patient tutor and guided me on the right track to pass my test. Great judge as to whether I was ready for my test and I wouldn't have passed without him. Definitely recommend Graham 5 star tutor and a great guy. 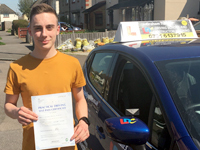 I had a bad first experience with a previous driving instructor however after finding Graham my overall driving as well as awareness and being safe on the road improved dramatically and I couldn't thank him enough. Graham was very patient with me and guided me all the way to the finishing line. Thanks Graham and I will definitely recommend him to anyone who is willing to learn driving the right way . Graham is a good man and will work to and understand your needs. 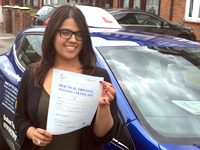 He converted me into a much safer driver and brought up my confidence in the lessons we had. He knew exactly what I needed to work on and when any problems occurred he knew how to go about them with ease, because where there's a Graham, there's a way. All in all, if you are thinking about calling Graham or giving him a try, you should, he will bring out your ability to drive and you'll enjoy your lessons. Cheers Graham. After learning with a couple of instructors I didn’t get on with I decided to go with Graham as he was recommended to me by a friend. 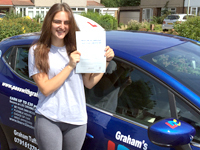 Right from the first assessment lesson I was very impressed with how organised and thorough Graham’s teaching was, he pinpointed the issues with my driving that needed addressing straight away. 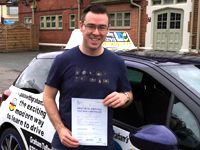 I found Graham to be a very informative, reassuring, and patient teacher, combined with his relaxed personality I noticed my driving confidence and ability increasing with every lesson. Anyone looking to learn to drive or continue to learn with a new instructor shouldn’t hesitate to get in contact with Graham, he’s an excellent instructor. Thank you very much for all your help Graham. 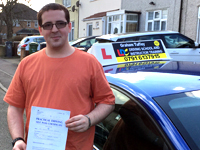 Graham is an absolutely brilliant driving instructor who taught me the skills I needed to pass my driving test. I would recommend Graham to everyone as he was quite patient and reassures me when I made silly mistakes. Thanks Graham for getting me through my test. At first I was skeptical about choosing Graham as an instructor. After reading so many good, positive reviews about him with hardly anything negative, I felt it was too good to be true. However, after some extensive research on other instructors and driving schools, I decided to give him a try. I was pleasantly surprised to find out that all the other reviews I had read were not an exaggeration. I found Graham to be patient, laid back and very easy to talk to. He went out of his way to give me advice and make me feel more confident as the lessons went by. Even when I felt I was not ready for my test and convinced I was not ready, he reassured me about my ability to pass and gave me confidence in myself. I would definitely recommend having Graham as an instructor as he would go above and beyond in helping you pass your test. All in all Graham is not a good instructor, he's the business. So, thank you Graham and I wish you the best in all you do. Graham delivers excellent informative lessons while mixing in his sense of humour to deliver a truly enjoyable learning experience. He recognises areas of difficulty and provides extra support to ensure that the learner receives suitable help at all stages on the course, whilst still progressing at a pace right for the learner. In addition to this he must have taught me to a high standard, as the driving I did on my test was some of the worst I had done in a long time, and yet I still managed to pass! Once again thank you. Passed first time with 8 driving faults. Graham was a great driving instructor that was always patient and explained everything very well. Not only did Graham teach me everything I needed to know for the test very well but also things that would not be asked on the test but would be used once I were driving. It was a pleasure to be taught by Graham and I highly recommend him. 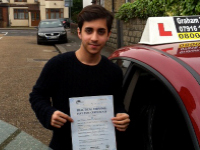 Passed his test with 4 driver faults. Thank you again for helping me pass the test! It was a great experience learning to drive with Graham, he was a very patient and friendly instructor despite me making mistakes constantly. The lessons were well laid out and very professional. He is very straight forward with the mistakes I had and explained exactly where the mistake were and how to correct them in detail. Always helpful with any questions I had. Would highly recommend him. 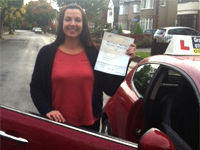 Kristie passed first time with 6 driving faults. I'd just like to thank you again for everything you did, it's greatly appreciated and I couldn't have asked for more! 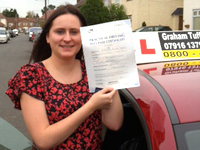 Graham is a great driving instructor and I thoroughly enjoyed my lessons. He's very patient, understanding and always happy to help in the areas that you want to work on. I very much appreciated his calm and relaxed manor, helping me to always feel at ease during lessons. I would definitely recommend him to anyone, thank you so much for all your help! 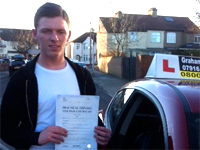 Adam passed with Zero faults. Thanks again so much for helping me pass I really do appreciate all the help and guidance you gave me. Here's a little testimonial for your website. Graham is a really nice guy who makes you feel comfortable from the moment you step in to the car. He will discuss everything thoroughly but without taking up lots of practical time and will focus on your weak spots or anything you are not confident on. I found my lessons very enjoyable with Graham due to him tailoring them to my needs and coming up with other ways of me learning if I was struggling with something in particular. After my first lesson he told me I could pass without any minors and he was right. I can't thank Graham enough for teaching me to be a safe and confident driver. I will be recommending him to anybody that is in need of an instructor. Thank you. Just wanted to say how grateful I am for all of your help and patience, you were by far the best instructor I've had and taught me exactly how I need to drive and it's a skill I now have for the rest of my life. I will in future recommend you to any friends or family that need a good instructor and sure you will help the them to become a better driver and pass there test also. Once again I am very grateful for everything and I can't wait to get my car now. 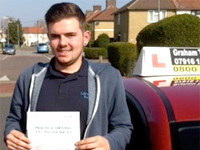 Louis passed first time with six driving faults. I fitted comfortably with this driving instructor. I believe this is because i felt as if i was in control of what i wanted to learn and at the pace i want to learn at. I believe that he would be able to change his lesson style in ways to suit the majority of people. Thanks graham. 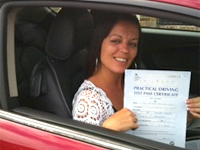 Nicky passed first time with just one driving fault. I thoroughly enjoyed every lesson I had. You were a patient and understanding instructor and if there was something that I wasn't completely comfortable with or I just wanted to practice it a bit more then you were willing to spend more time going over it. You helped me become the confident driver I am today, but also made me realise that driving is not to be taken lightly and that my actions must be responsible for the safety of myself and others. Kevin past on his second attempt with one driver fault. Graham is highly recommended by me. He is very professional and shows a high level of understanding, allowing me to see where I went wrong and how to perfect it and with his help I was able to pass with confidence. Thank you Graham !!! I thought that the tutoring I revived was brilliant, I liked how I could go at my own pace with learning and not at a fast pace. Also I thought how the lessons were not just about passing the test by were designed to build confidence and developing good driving habits. Overall I really enjoyed the lessons I received. I finally passed my test, but it wasn't easy. I had a test booked and 6 days before it my instructor pulled out. That was when I met Graham. As it was such a short time away I had 2 lessons to get used to the car. Unfortunately I failed that test because I judged gallows corner wrong. After that I was a bit down as it was 8 weeks till the next available test. But then Graham stepped in and managed to get me a test within 3 weeks. Graham went out of his way to book the test for me, even paying for it to secure the test for me. As we had only known eachother for 2 weeks this was a very kind and trusting thing to do, and much appreciated. 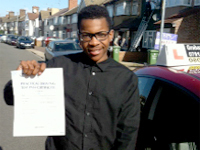 After 2 more lessons I had my test and passed with only 3 minors. Without all tthe help from Graham I don't know if I would be driving yet. He is a very calm patiant instructor and im not the easiest person to teach after 12 hours at work. But I would recommend Graham to anyone who wants to learn to drive. After every lesson there was the feeling that you have learnt something new. I always finished the lesson wish a massive smile on my face. Probably one of the best recommendations I received this year was to take my lessons with this great man Graham, your way of teaching made me feel comfortable throughout the process and the lessons themselves were always fun while still accomplishing the essentials and more to pass my test. I would definitely recommend G to anyone out there looking to take well worth it lessons. It's been a pleasure learning to drive with you, I truly believe you've put me on the right path to be a great driver, thanks a lot and all the best in the future. I would recommend everyone to learn to drive with Graham. 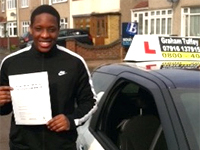 Throughout all my lessons Graham was calm, relaxed, friendly, made me feel safe and confident in being able to drive! Never did he get angry despite me making mistakes and his tailored lessons made sure that when it came to my test I felt confident on driving on any kind of road and with my own driving capabilities. 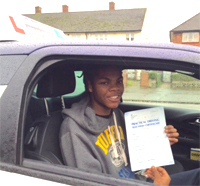 With his help I was able to pass first time with three minor driving faults. Thank you so much Graham for taking the time to teach me how to drive, you are one of the loveliest person I have ever met! Passed first time with 1 driving fault. I was recommended to learn with Graham through my brothers friend because of his high pass rate and I wasn't disappointed with the end result. Both me and my brother passed first time, he had only 2 minors and I only had 1. Throughout my lessons I always felt calm and relaxed and he made me completely confident in my own abilities. 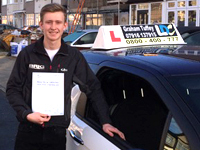 Grahams friendly and calming attitude helped me to feel at ease and at times it was almost like I was just going for a drive without the pressure of learning. I would highly recommend him to anyone, he is your key to success. 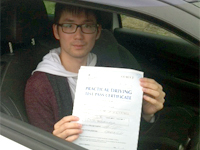 Lee passed first time with 1 driving fault. 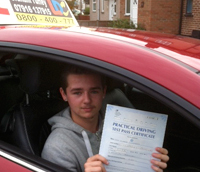 Dan Passed with two driving faults. Thanks for all your help, it was a joy to be your pupil, a pleasure to learn and your knowledge and skill is second to none. Many thanks. 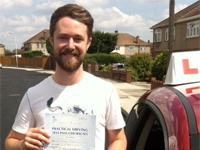 Graham is a fantastic driving instructor who has allowed me to pass my driving test on my first attempt! His patient and positive attitude made my experience enlightening and quick! I have no hesitations in recommending Graham to anyone who wants to learn. 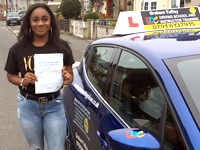 Even though I passed my practical exam, I would always strongly consider contacting him in the future for refresher courses or further developments surrounding my driving practice. A great teacher and friend. Lastly, I wish to recommend Graham's Alfa Romeo. It's a fantastic vehicle for beginners and advanced drivers alike. It's extremely easy to drive and very smooth on all terrains and weather conditions! Graham is an excellent instructor, he explains tasks efficiently and makes them easy to understand. I now feel very confident going out on the roads alone due to his tuition. The car (Alfa romeo) is extremely comfortable to be in and drive. Thank you very much for getting me through my test at such sort notice. I really enjoyed my lesson with yourself as you made them fun and enjoyable. I have learnt a lot about being a safe and careful driver and will carry that with me through my driving in the future. Thank you again for your time and most of all getting me to pass. 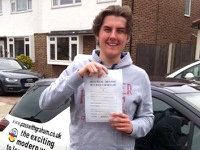 Michael passed his test with 1 minor driving fault. Learning to drive was a pleasure, and having run nobody over (to date) I feel I have far surpassed my goals, thanks to Graham. His trust was far greater than I expected, and the amount of time spent parked talking about driving was negligible compared to the time spent actually driving, which I feel I couldn't have gotten elsewhere. My experience was very positive, and led me to recommend Graham to a friend who has also since passed. Thank you. I will definitely be recommending Graham as a driving instructor for any new driver. He is such a great instructor and has so much patience, he made me feel comfortable and confident during all my driving lessons and explained things in great detail for me. I managed to pass my test first time thanks to Graham, he is a star! 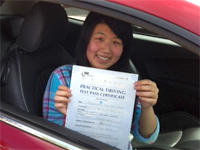 Passed with 4 minor faults. Thank you very much for your patience and understanding when teaching me to drive I appreciate it! 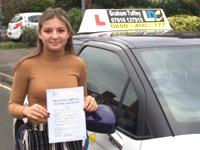 When I first started my driving lessons I was very nervous due to a previous car accident Graham was very patient understanding and helped me to get over that and learn to drive! 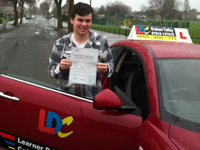 I would highly recommend Graham as an instructor to anyone thinking of learning to drive thanks again Graham! When I first met Graham I had never driven before and was very nervous about driving. 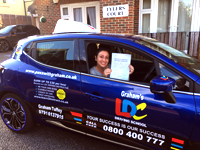 As soon as I sat in the car Graham made me feel comfortable and calm he turned me from a nervous scared learner to a confident qualified driver in a matter of months and I was able to pass my test first time. Would never have been able to do that without Graham, thank you Graham. 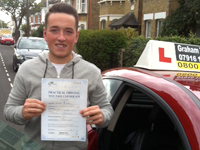 Charlie passed first time with ZERO driving faults. My experience with graham was great. He help me massively whilst learning to drive, also graham is an amazing instructor putting me under no pressure what so ever when driving. If there was a problem graham would encourage you to not get down about it and he will also make sure you will not do it again. Couldn't have asked for a better instructor. 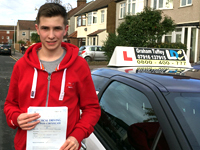 Tom passed first time with just 1 driving fault. It's been a pleasure working with Graham. He makes you feel relaxed when in the drivers seat, he will make sure that you feel comfortable. He actually wants you to pass and will do every thing he can to make that happen with as minimal minors as possible. 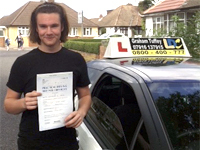 Reece passed first time with 2 minor driving faults. I couldn't have asked for a better instructor. Graham was really understanding and such a great teacher. He didn't make me feel nervous in any way. The way he taught me how to drive was really easy and not in any way complicated. Such an easy person to get along with and made me feel relaxed everytime i had a lesson with him and even if i had done something wrong he wouldn't bite my head of and scream at me he would explain to me in a calm manner what I did wrong and tell me how to put it right! I would recommend graham to anyone who wants to learn how to drive because you'll have an amazing driving experience if he's your instructor! I applied for my provisional licence in 2003. Within that time, ive had my share of driving instructors and had made several attempts to book my driving test. Mentally, for some strange reason, I always felt I was incapable of passing and every time I booked it, I would always cancel. Ive taken my theory test 3 times and passed, but due to its 2years time limit, time would lapse and I would have to retake it. I'm so grateful to have met Graham Tuffey. He gave me the encouragement and confidence I needed to believe in myself. He is not only a great instructor, he is a great person. I would recommend him anytime any day. Thank you so much Graham for your patience, kindness, yet firm teaching. I really couldn't have done it without you. I was recommend Graham by three of my friends after I wasn't happy with the instructor I was with at the time. 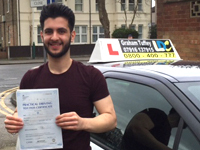 Graham made me feel relaxed and confident and his teaching techniques have definitely made me a better driver. He was always there when I needed help and advice.I would highly recommend Graham as I passed my test with only 1 minor. Thank you so much Graham you are an excellent instructor. Graham was the second instructor I had and was a recomendation to me. From the first, Graham made me feel at ease and explained things in ways that were easy to understand. He was very patient with me when I didn't always get things first time. He also boosted my confidence and I would happily recommend him as a first rate driving instructor. This is proven by my passing my test with no driving faults. Thank you so much Graham. 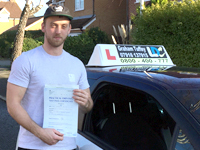 I recommend Graham Tuffey as he is a very helpful driving instructor and helped me pass first time. He tells you everything you need to know and doesn't pressure you at all even when you make mistakes, he just supports you and fully helps you to improve. I enjoyed my learning experience with Graham as he is a great teacher and I am very grateful, thank you. Choosing Graham was the best decision I ever made, he truly is the best driving instructor!! He is so passionate about his job and making sure his pupils will become a safe, careful and considerate driver. 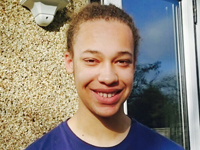 Throughout his lessons I have found his knowledge and experience influential to the way I have learnt to drive safely and with confidence, he also has a very witty sense of humour always making me laugh. On our very first lesson I felt at ease and comfortable straight away with him and I looked forward to every lesson we had together. I will always be grateful to Graham, with his help I passed first time with 4 minors which i'm extremely proud of =) Thankyou Graham!! Looking forward to seeing you again when we do the pass plus! 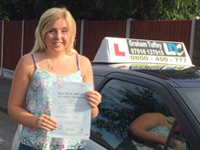 I belive that the investment and time that I put into my driving lessons with g where very much worth it. He explained in full detail what it is that I would have to do. And had a lot of patience with me. He was very tolerant and kept he's cool even when I was making silly mistakes. He helped greatly and I very much appreciate his service. 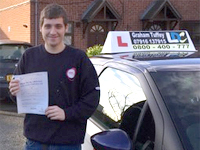 I highly Recommend Graham as a driving Instructor as he is a very nice guy, really calm and patient too. Also he is very reliable. Don't hesitate in picking Graham as your Instructor as you won't regret it.Would just like to say a BIG thank you to you Graham for all your help. Am really grateful to you and appreciate all your time and efforts into getting me to pass my driving test. I'd like to say a massive thank you for all your help! You have been an amazing driving instuctor and also an amazing person. 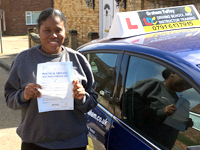 I would also like to thank you on the help on passing my test, being so patient with me on my 'rough' days. When I cancelled you understood why and I appreciated that alot! I love driving! Its like a God send. Dont miss waiting for the bus at all lol! I have been driving from the day after I passed constantly. Although I still do walk to my local shops (suppose I cant stay lazy lol). Once again for being a great instructor and I have told everyone what a great teacher you are so hopefully a few people will experience what I have.. They wont be disappointed thats for sure! I enjoyed my time working with Graham during the course of my lessons. He is very helpful and makes you feel comfortable instantly. Graham makes sure you know how well your doing even when I felt I had made the wrong moves he still encouraged me and gave positive response. Learning to drive was mad really easy with all the great help I had from my driving instructor (graham tuffey) I would highly recommed him to anyone. The experience was fantastic, like seriously! From starting as quite an unconfident driver to the driver I am today in such a short period of time is amazing! I don't think I could of done it without Graham's help! The fact that he did not teach like most instructors who look down on you, he kinda worked at the students level so you thought more of him as a friend than a driving instructor! Thanks a lot graham! Learning with Graham was great! He constantly provided help and support wrapped up in a funny anecdote, excelling my confidence behind the wheel after a matter of weeks. I wouldn't recommend anyone else but Graham, he will not only help you pass your test but you will honestly enjoy doing so! I had a great time while learning to drive with Graham. He is a great instructor in my opinion and he helped out a lot. Graham was very supportive all the time and also very patient, he made sure I understood what I had to do all the times, he encouraged and was always honest, always told me what I had to improve so I always knew what to work on. Thanks to him i have my driving license today. I advise anyone who wants to have driving lessons to give him a call specially young learners, he is a very supportive instructor. I wanna say a massive thank you to graham for helping me pass my test and I would 100% recommend graham to those who are thinking about learning to drive. I was quite nervous at the beginning but Graham was very nice and assured me ill be fine and he is very friendly and is patient with you when you do things wrong. The lessons are definitely worth the money because you spend most of the lesson driving instead of just sitting at the side. He goes through things at the pace you want and doesn't rush into it and the explanations are very clear. He is also very helpful out of lessons as he send you videos that can help you improve and make you aware of things you wouldn't of known. Graham encourages you that you can do it if you have belief and he has made me more confident on the road. SO THANKYOU FOR YOUR HELP GRAHAM! 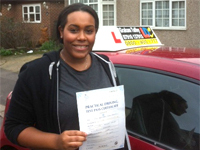 I am very pleased to inform you that I passed my driving test this morning at the Hornchurch test centre with 1 minor (undue hesitation), and with the same examiner Ms. J. Cocklin; she remarked that it was a very lovely drive! I am very grateful for your support and guidance during my training and practice sessions. I feel that without your help I couldn't have been able to do it. I just wish that I could've passed the first time with you, but I guess all that matters now is that I passed. I had a very good experience training with you and I have learned a lot. I found two emergency vehicles on my way to the test today and i feel i dealt with them easily only because of the information you had sent me a few days ago. Please do send me further driving tips if you feel they would help me in the future. I would like to thank you again for all your help and cooperation. I already had an instructor picked out to work with but my husband met Graham once and that was that! I had had one other instructor and three tests on my belt so the first time I met Graham, I knew it wasn't about the money or anything else but it was about me - my ability to learn, how I liked to learn and what I needed. Graham was never in a hurry and when he was with me I felt like I was his only priority. He encouraged, coached, clarified things over and over and was always patient. 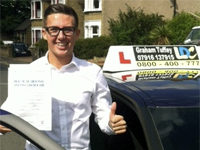 I recommend Graham to new drivers, experienced drivers, old drivers, young drivers! I would wish you luck with your learning but with Graham you won't need it. He's a man of integrity and will do right by you. I would definitely recommend Graham to anyone taking driving lessons. He is very patient and calm and will correct you on your mistakes in a very relaxed manor, putting no pressure on you whatsoever, but at the same time, being very honest and highlighting the areas that need improvement. 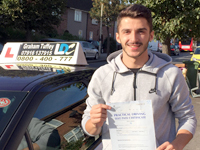 His teaching techniques are second to none and got me through my test with just 3 minors! He helped build my confidence as a driver and made driving for me a pleasure. I would also like to add, he is very reliable as he was there on time, every time and was always up to date on where I was with my progress. Thanks you graham so much, it has been an absolute pleasure mate. Learning to drive with Graham was a great experience, the lessons well laid out and very professional and helped me to pass most of all : ) thanks Graham : ) He stuck with me and taught me everything i needed to pass. 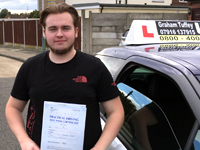 I really want to recommend Graham to anyone who wants to pass the driving test in a short period of time and in a very relaxed way. He is such a skilled instructor, organised, patience, friendly and with a fantastic sense of humor that makes the lessons more enjoyable. I'm a very nervous person but he helped me gain confidence and never made me feel uncomfortable even when I made the same mistakes many times. I'll always be grateful to him for helping me pass my driving test!!!!! just five minors. He is just brilliant and the best!!!!! THANK YOU VERY MUCH Graham for all you have done!!!!!!!!!!! It was a real pleasure to learn with you. Thank you very much for your time and patience and getting me through my test. Just wanted to say a big thank-you once again for helping me to pass my test. After numerous driving lessons (and instructors) with a well known driving school, I stumbled across Graham's website and decided to give him a try. 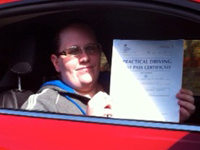 I had always been a very nervous driver and felt I hadn't made any progression with previous teachers. Graham's calm, methodical teaching approach gave me the confidence to pass - something which I never thought I would happen after 5 years of trying!! He was always prompt, never missed a lesson and gave me clear guidelines on what we needed to do. At the start and end of every lesson we would assess the drive which really helped me focus on areas that needed work. 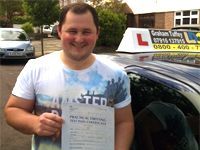 I can't recommend Graham highly enough - THANK YOU for helping me pass my test, I couldn't have done it without you. 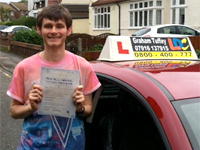 A huge thank you to Graham Tuffey for making my driving lessons as stress free as possible. I've always put off learning to drive as I was always so nervous about it, however Graham has a very calming nature that made learning a pleasure. Each lesson's objective was was explained clearly in advance so I always knew what to expect. I would highly recommend Graham to anyone looking for a friendly and patient instructor. 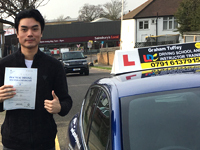 Graham is a great and professional driving instructor, he was very patient in my first few lessons and kept giving me tips and guidance which helped me to become a better driver. Very reliable with lessons and flexible if needed. I felt that my money was not wasted and all the time i had paid for was well spent! 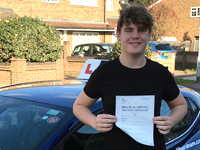 Started lessons with Graham after my Son passed his test 1st time with him & is now such a good driver !!! Took my Test a couple of days ago and also passed 1st time with 8 minors & every lesson was enjoyable as he is very supportive and calm as an Instructor & very devoted to his job !!! I would like to take a moment to thank Graham. I have got to say I never thought I would take my test the first time and pass. Graham was beyond patient with me and helped me master any difficulties I had. Im so ecstatic I passed and I couldn't have done it without the help of Graham. If you are looking for an instructor who is skilled, patient, ENCOURAGING and has a great sense of humour then Graham is your GUY!!!!! THANK YOU GRAHAM YOU'VE BEEN UBER AWESOME !!! I can honestly say that my experience with graham as a driving instructor was nothing but positive. He truly went beyond expectations and constantly tries to provide the best experience possible for each particular study. Every lesson is carefully planned out, and he pays close attention to each students learning methods. A great teacher. Highly recommended. After reading the testimonials from his previous students I decided to give Graham a call. I'm so glad I did! I hadn't driven for a few years and was nervous about getting behind the wheel again. Grahams calm and supportive manner took all the stress out of learning to drive. He is patient, friendly and a true professional. I never would have passed my test without him and the confidence that being well taught gave me. So Graham, thank you again for all your help and support. You are a fantastic tutor and I can't recommend you highly enough! I would like to thank you very much for helping me pass my driving test first time! Throughout all my lessons I felt that you helped me alot, concentrating on my main issues and helping resolve them. Many thanks again! Learning to drive with Graham was a real pleasure. He was calm, reliable and informative as well as organised, efficient and up to date. 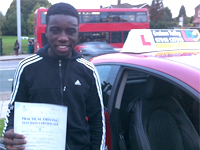 He highlighted my areas of strength quickly and effectively helping to increase my confidence behind the wheel. He also identified my areas in need of development accurately; breaking them down and making them feel more manageable. 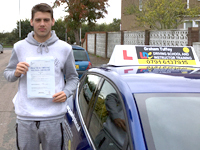 With Graham's assistance and first class teaching I passed first time with minimal nerves and 6 minors. I would like to take this opportunity to say a BIG thank you to Graham for being such a skilled instructor and a true gentleman. I recommend Graham whole heartedly. 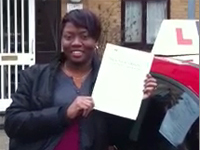 I have been learning to drive since August 2011 and recently just passed my test in November 1st time. 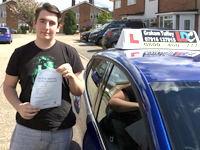 Although I had a slow start getting to grips with driving, thanks to Graham's patience I managed to make fast progress due to a friendly and skilled teaching style. I would like to thank him for his encouragement which got me through the test. I would recommend Graham to anyone who wants to start driving. I had been learning to drive since July 2010, my instructor didn't seem to be improving me, he also turned up late regularly despite living in the same street as me! I came across Grahams website and gave him a go at beginning of March 2011. He was very calm and took time to see what were my good and bad points and where he thought I was in relation to doing my test. At the end of each lesson we went over all I had achieved and what needed improving and what I was doing well, he always answered questions when asked and has proved to be a great instructor, very calm and helpful. I have just passed my test 1st time with 7 minor mistakes. Thank you for your help Graham and getting me on the road. This is to thank you again for all your efforts and encouragement in making me pass today's driving test. Thank you for being such a patient and polite instructor. Thank you for believing to the last minute that I could pass. It was nice to have you sitting in the car wishing me well and going all through the emotions with me. I appreciate every effort you made to make me believe that I could pass. I wish my driving faults were not as many. However, Like you said, the most important thing is that I have passed! Once again, thank you and may God bless you richly. I highly recommend graham as a driving instructor he is friendly reliable and professional and helps you to achieve your best ability. It was a pleasure to learn with graham and am grateful to him for getting me through my test first time with only two minor faults. Graham is a brilliant instructor, he is very patient and doesn't make you feel nervous or uncomfortable if your not sure about something. I passed on my third test and Graham was very supportive throughout, and gave me the confidence to believe I could pass my test. I would strongly recommend having Graham as a driving instructor if you are thinking about starting some lessons. 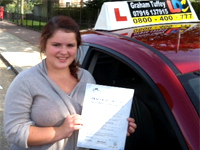 This is to thank Graham for helping me pass my driving test yesterday on my first attempt. 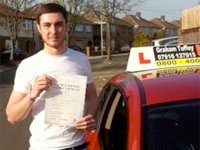 Graham is a highly professional, organised and friendly driving instructor. Over the few weeks we worked together, he has effectively helped me "convert" my driving from the right-hand side (European) to the left-hand side of the road (UK). With his calm, considerate and professional approach, he guided me through the UK driving system, helped me gain confidence in driving on UK roads, and most importantly, he corrected many bad driving habits that I have developed over the many years of my previous driving experience. I can't thank you enough Graham for your patient, encouraging and friendly teaching approach, without which I would have struggled longer to learn to drive in the UK. I will definitely recommend you to other learners for the many years to come! Thank you very much for your email and for your help throughout my learner driving experience, both theoretical and practical. I will definitely keep working on my driving skills, and will certainly consider taking an AMT or a PP when time and money allow for it in the future. I passed my test today, first time with only 5 minor faults. 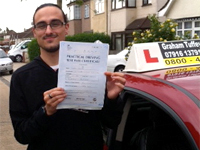 I enjoyed all my lessons with Graham i would really recommend Graham as an instructor. Graham is a down to earth calm person who really wants to get the best out of his pupils. Graham keeps you informed of all your lessons by email or text and never lets you down. He is the best instructor you could want!!! Thanks Graham for all you have done, I really appreciate everything. I've been learning to drive with graham for a few weeks and its been great, I chose to do a semi-intensive course and have recently passed. 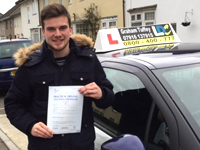 Graham has been a great instructor, very patient and helpful. I also took the option of doing a pass plus with graham and after six hours of relaxed tuition I've passed. 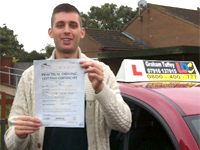 Driving with Graham is relaxed and easy going, helping you learn and drive safely without any un-needed stress. I would highly reccomend Graham as a driving instructor for anyone. 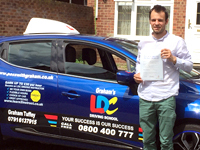 I passed first time with Graham and was so glad I was recommended to look at the LDC instructors in my area. From my first e-mail contact Graham came back to me within a few hours and was able to answer my queries and concerns professionally and confidently. His patience never wavered, even when I made the same mistakes a dozen times. Graham's relaxed, friendly yet professional attitude put me at ease and made me more confident. 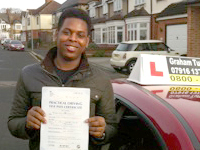 His own driving experiences proved to me that I was not alone being an 'older' learner and reinforced positive behaviour in my driving to help me be a better driver. The tools that the LDC and Graham use, including diagrams and pop quizzes made me think about how I was driving while on the move and for future situations and not to just pass the test. I would highly recommend Graham for his calm considered approach to each individual learner, his professionalism, advice and sense of humour when teaching to make a nerve racking experience enjoyable. Thanks again for all your help with my driving! Thank goodness I was a positive statistic ! I can't thank you enough for helping me to pass my test. 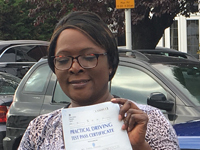 After having my previous instructor shout at me and at times grab the steering wheel I felt so disheartened to drive, but due to the fact I had to start driving for my job and had to do it quickly the intensive course seemed the best choice for me. You were so calm at all times and it started to make me enjoy driving even with the hectic 5 hours a day. As I said to you, I would recommend you to anyone if I could but will keep you in mind for anyone that does want to start driving. People may think these testimonials are over hyped but after experiencing learning with graham you will understand why he has such good remarks. Thanks again Graham and see you soon for pass plus. Well I'd like to say im 17 fresh driver learn fast etc, - the truth is im 24, I had some bad habits from previous driving experience and even instructors and I'm quite stubborn he he. Graham is a very honest man both in how many lesson I needed and what needed changing to pass my test and be a good driver - there's driving then there's driving right and tbh I couldn't have asked for a better teacher. I know a lot of these testimonials are saying great and brilliant but it can be hard to get a good view of graham from 1st time drivers (no offence). I've had previous instructors over the years and in some ways I'm quite unreformed but really graham is a great instructor, says exactly the right thing, he knows what needs work and what don't, has amazing people skills and alot of experience. I'll be recomending him for along time, but also striving to be a better driver mastering what has been learnt. Also to note, which I think is quite important, is that graham takes alot of of pride in his work, it really shows when your instructor enjoys his work, the learning proccess is more effective and the experience is more whole. My driving experience with Graham was a fantastic one. At first I was nervous but I found him calming, encouraging and exactly what I needed to help me settle in and get started. I found his style of teaching fantastic, everything was clearly explained and I found the pointers he gave never too much or too little but exactly what I needed to develop my driving. 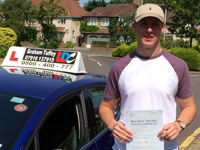 I passed my test first time I would, and already have recommended Graham as I have become a confident and safe driver through his tuition. Thanks for everything Graham, I appreciate your hard work. I have taken my classes with Graham Tuffey. I had no experience in driving at all and the first lesson I knew nothing about the driving or the car itself, however when I started my first lesson he gave me a lot of confidence and reassurance that I will be a very good driver in the future and I will learn bit by bit. That's what I need it at the very beginning, is to believe. First of all I think tutor is not trying to get money out of your pockets and only advise you how many hours you will need and if you learn quicker then it's very good and he is happy to book a test as well as get you up to standard. He has so much patience that it never made me stressed or uncomfortable. I have passed my test at the second time and to know how many people don't after so many tries I am really greatfull and thankfull to good driving lessons. Thank you for all your support and confidence given on the road it was a good time and I enjoyed so much. 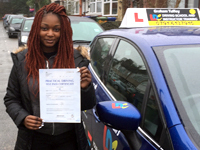 I started driving straight away at 17 with another instructor, after a year I was not ready for my test and went to uni, I failed two tests while at uni, then when I finished I got in touch with Graham and we decided that I needed the test booster course. 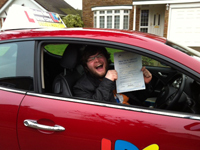 I passed first time with him with four minors (which was exactly what graham predicted would happen). 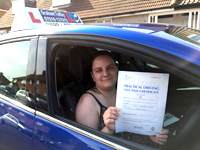 All the lessons were helpful and I learnt something everytime, I felt very comfortable driving and they was not boring. I am very thankful for grahams help and would highly reccomend him to anyone learning to drive. 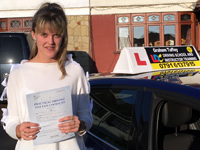 I am writing to say that after having tried two other driving instructors I tried Graham Tuffey and found him to be very honest with me about how many lessons I needed before I took my test. He made me feel very confident, was very patient and friendly and helped me when I encountered a problem and was very understanding. If it had not been for Graham don't think I would have passed. So once again thank you very much and I would recommend you to anyone. Just to thank you for your good heart as a good instructor. Sorry I took so long to write to due to computer problem and I had no access to internet. I can only remember the way you use to encourage me that I can do it the very day I started lessons with you. I wish I could find you more pupils or learners and up to now I can't belive it. You are a very good teacher keep it up. Graham is very patient and inspires confidence in new drivers. 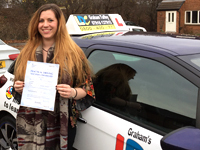 I previously had lessons with a well known national driving school about a year or so ago and had not felt at all confident in driving so gave it up as a bad job. 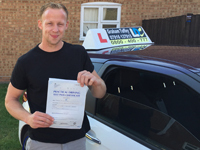 I was impressed by Graham from the 1st lesson with him and he had faith in me, this made me feel more capable as a driver and in fact boosted my self confidence as well. Things did not go totally to plan but Graham persuaded me that I could do it and I eventually passed on my 3rd attempt. Thanks again Graham! 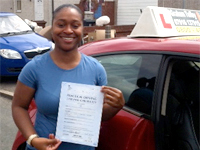 I learnt to drive when I was 17 with another driving school and dreaded driving lessons. I took SEVEN tests with the same instuctor and gave up after failing all tests. Graham was recommended to me when I moved into the Hornchurch area. After meeting Graham I was shocked to see that some body teaching people to drive, when making the same mistakes, could be so calm. When I first met Graham my partner had explained to him that I had a phobia of driving over bridges and fly overs - with in a month Graham had shown me how to conquer this fear and I now complete them with no fear what so ever. Graham gave me a book that we went through at the end of each lesson, which helped me and gave me feedback. The book also had a check list that we marked together, this showed whether I could do something by myself or still needed help from Graham. He used the checklist which helped him to prepare and plan lessons as he knew what I needed help on. Shortly after we had completed all the tasks on the check list I passed my test first time with Graham with only THREE minor faults. Graham has given me and my family so much more freedom as well as more confidence in myself! Graham is a really good instructor and knows when his students are ready for their tests and helps them to feel at ease. I would recommend Graham to any one and one of my friends has started lessons with him. 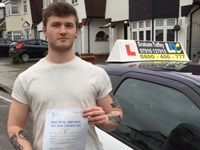 Hi Graham, once again thank you very much in helping me to pass my driving test. 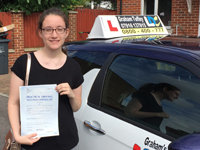 I was really impressed by your style of focused tuition which helped me to build up my driving knowledge in stages, monitor my progress and identify areas for improvement - thus helping me to get the most out of each lesson. I also found you to be really friendly, patient (even when I would get frustrated) and professional as well as flexible in accommodating any changes I needed to make to my lesson times/dates. I will definitely be recommending you to others as I believe you are one of those rare breed of driving instructors who really cares about their students and wants to help people to become good drivers.....not 'just scrape' through their tests..!! Thank you so much for teaching me to drive ! I am still in shock that I passed but you had every confidence that I could do it, so thanks again and again and again you are a brilliant teacher. 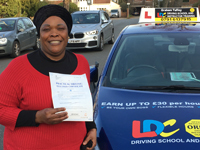 I have been attempting to take driving lessons for about three years now and all the companies i had tried before just couldnt make me feel ready to be behind the wheel so I searched online for driving instructors and intensive courses and came across LDC. After reading about their teaching methods and courses available i decided to give graham a call to see how he would be able to help, and within two months i had passed my test !!!!!! after purchasing the dvd and workbook I booked my theory and thanks to the dvd felt surprisingly confident and went on to pass my theory first time! I then booked the 30 hr course over ten days and enjoyed every minute, two days after my lessons finished i passed my practical test. 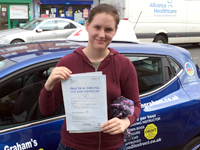 Graham was always supportive and understanding, I was very nervous about driving before i started the course and could never see myself getting over that but after the first lesson i already felt more confident and could see an end to my driving fears, graham was full of helpful advice and a calming teacher. I would highly recommend graham and the LDC intensive courses to everyone, I was so pleased with the course and the lessons were always relaxing and tailored to suit my needs. Thank you so much graham, i love driving and my new found freedom! You could have warned me more about petrol prices though!!! Graham is very professional, punctual and polite. 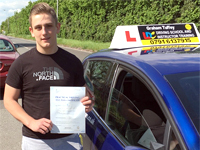 I would definatly recommend him as he taught me all i need to know in order for me to pass my test first time. He was never late for a lesson and wasn't a time waster! You were always very friendly, patient, helpful and punctual and you made the learning process enjoyable. i found your teaching methods reliable, effective and very easy to take in and you gave me the confidence i needed to pass my test after a lot of stop starting with previous instructors who always let me down - but you never did, you was always there to answer any questions or concerns i had, helped me build confidence on anything i wasn't feeling 100% on and i never thought i would actually get there but i did..thanks to you. i will be highly recommending you to anyone and everyone that wants to learn to drive with a patient, friendly, professional and helpful instructor. i had a great experience learning with you and I am sad that the lessons are over but now i have passed my test i am able to go out and buy my first car so im very excited. I have got my car now I am enjoying my driving very much. Thank you very much for giving me the edge for my driving test. You have a very professional approach to teaching how to drive the right way thanks mate. 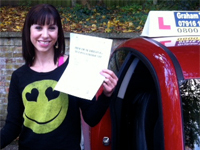 Thank you sooo much for helping me pass my test, it was a brilliant result with only one minor!! You are a very good and patience teacher and I will be recommending you to my brother and any others that I know who will be willing to drive. ou didn't give up and you were always a phone call away if I needed any help, you put yourself out there to help your pupils. I had numerous of instructors before you that just didn't understand me but you were different. I cannot show you how thankful I am but I hope that you know. I have recently taken lessons with graham. 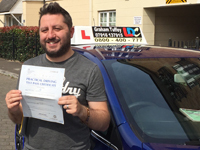 I would recommend him to anyone beginning to drive as he has a calm relaxed manner which makes you feel confident and comfortable with what you are doing. I believe the qualities graham has as instructor helped me feel confident on the day of my test, I feel that this helped me pass first time. Graham was always punctual and polite. 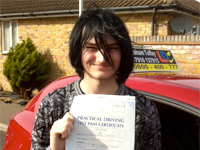 He also gave me advice for when I passed which has really helped we driving on the roads on my own for the first time. My name is Wayne and have recently taken lessons over a six week period with graham. I found graham very knowledgeable, friendly, patient and reliable. He was able to indentify where my weakest areas in driving were and by focusing on these areas, thanks to his good tutition, I quickly improved. Graham gave me the correct knowledge and confidence to successfully pass my test first time, something I am very proud of. I would definitly recommend graham to anyone who wants a good driving instructor who has the pupils best interests to heart. Thanks again graham for getting me through. I'd recommend you to other learners because you're a patient, friendly and thorough instructor. You always stayed calm and made me feel confident when driving. I was always kept up-to-date with my progress and the areas I needed to improve in which was very useful. I never felt scared to ask questions as you were always helpful whenever I did. I also never felt rushed into doing things, for instance roundabouts, without you thoroughly preparing me for it. 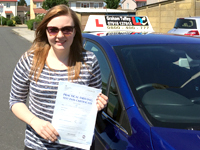 Your great teaching skills meant a first time pass for me, with so few minors. I recently completed an intensive six day course with Graham, passing my practical with only a handful of 'minors'. Graham ensured I was very well prepared for the exam, mixing good all around driving techniques with more specific instruction geared toward passing the exam itself. His knowledge of local test routes was invaluable when I took my exam; there were no surprises and as a result I was relaxed throughout. I would highly recommend taking lessons with Graham. Thanks again Graham for your help with the driving. I just wanted to say a huge thank you for all your support, and encoragement you gave me throughout my driving experience. It was purely down to your excelent tuition skills that i was able to pass my test. You helped me to bulid my confidence, so now i feel compleatly fine when i drive on my own. You really are a fantstic teacher. I would like to thank you for helping me to pass my exam. I found that Graham is very patient, friendly instructor. He made his promise that my first driving test will be the last. I will recommended him to other learners. His techniques are easy to remember and follow them on the road. 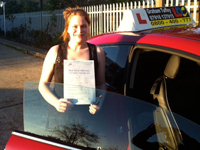 Thank you so much for all the hard work and encouragement to help me develop the skills to drive safely. I am glad I've gained the confidence to be on the road. Graham is very a patient and reliable driving instructor who helped me pass my test first time (and also a friend who gave me his number passed first time). If I had to do it all again Graham would be the first one I'd phone. Thanks Graham you're great. Thank you so much for helping me pass my driving test, don't think I would have done it without you. So thanks so much. This is to thank you tremendously for all your support, patience and the excellent lessons and instructions you took me through. I am overwhelmed that I passed first time after booking 12 hours with you. 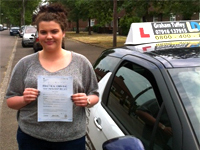 I am very grateful for your invaluable help and encouragement which enabled me to pass my driving test first time. 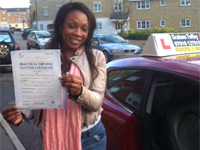 I would like to tell you that, taking lessons from you has boosted my confidence and my driving skills have improved. I would recommend other learners to take lessons with you because you methods and techniques of teaching are very practical and easy to remember during the test and while on the road. A previous student recommended Graham to me and I am glad they did. Having never driven before I was quite nervous, but he is very calm and patient and helped me build my confidence behind the wheel. His driving techniques are easy to remember and easy to put into Practice. I would recommend Graham to anyone learning to drive and I am very grateful for all the tuition which I can now put into practice. I am writing just to say thank you, once again, for you excellent tuition. 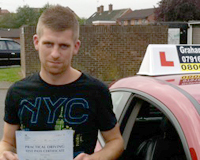 It was due to this that enabled me to pass my test first time. Throughout the week of my course, you helped to build on my confidence to pass as well as a thorough teaching of driving skills. These were delivered in an easy to follow way, in an encouraging manner. 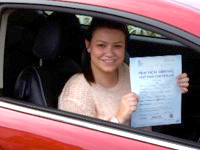 My name is Kathryn and I learnt to drive with Graham on an intensive course. I found him to be patient, understanding, calming and very clear in directions. Graham is ideal to learn with as he is very easy to talk to and kept me honestly informed of my progress. He kept me focussed on the areas in which I needed to improve upon. 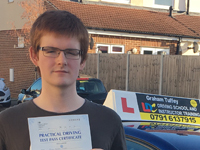 I had not had much experience driving, a few lessons 4-5 years ago and some lessons with my dad just before my course and I went from a real learner to passing my test first time, I would recommend Graham, I think he could take on anyone and successfully teach them to drive. He doesn't just teach you to pass your test he teaches you to drive. I did an intensive driving course with Graham Tuffey and found him very easy to get on with and his teaching style straight forward. I never felt afraid to ask anything and he was always helpful with any questions I had. I have passed his details on to all of my friends who want to learn how to drive and they are happy that I did. Driving is something that doesn't come naturally to everyone and Graham has the patience to go as slow as you need and make you feel at ease. 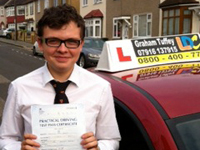 I passed first time and I think that in itself is a great testimont to the tuition Graham gives.